25 January, 2012. It was a Wednesday. I’ve asked for an explanation, definition, blog post, book, or any other source of material that can get me up to speed on REST in web development a number of times. It’s a popular subject these days, and there seems to be an abundance of knowledge and information out there. Except that it’s all wrong. Every last bit of it. … or, at least the handful of people who inevitably respond with comments like “no one does REST correctly” and “that’s not REST” would have me believe. Frankly, I’m tired of this pedantic, obnoxious response. The same people that continuously say “no one does it right” can’t seem to tell me why it’s wrong or point me to a resource that does do it right. Here’s the deal. If everyone does it wrong, then write a blog post or a book or a screencast or something that tells the world how to do it right. 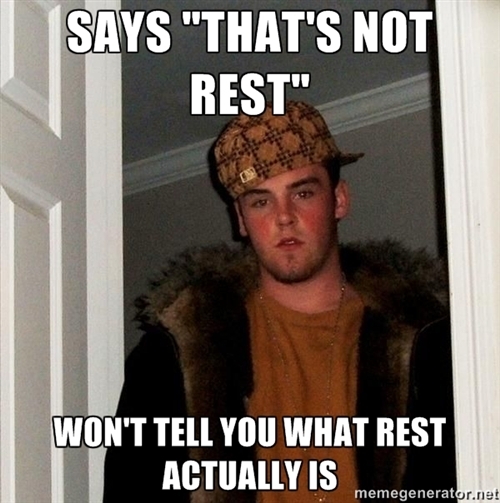 Until you can point people to what REST actually is, stop telling everyone that no one does REST right. I have work to do. I’m obviously going to do it wrong, but frankly, I don’t care at this point. My system will work just fine, just like every other “That’s not REST” system out there. Get Some REST: A work in progress book from Steve Klabnik. I signed up for the mailing list and am eagerly waiting. There’s rumor that Steve might actually be doing it right. RESTFul Web Services – I bought the Kindle version last night. It’s the book DHH says everyone should read and a few others also suggested it. REST In Practice – I’m probably going to buy this one, too. It seems to have the “30,000 foot view” that I’m also looking for, according to one reviewer on Amazon. If anyone else has any resources for how I can learn non-REST, RESTful best practices, I’d love to know. Thanks to everyone who is responding in the comments here and via twitter. I’m going to update this post with the resources that people are pointing me to, from Twitter. The majority of my experience with anything REST-like comes from working with Ruby on Rails, and mimicking it’s handling of HTTP verbs with Sinatra application. I know this isn’t anything near correct, which is why I’m looking to find good resources. I’ve been getting a lot of “you don’t need to do pure REST” responses – which I agree with. One of my problems, though, is that I’m having a hard time figuring out what “pure” REST is so that I can know the difference between that and what I’m actually doing. Sebastian Lambla points out that it’s not the entire REST community that pulls this crap. There are plenty of people that are helping, providing good information and creating good resources to throw at people like me that are wanting to learn. My problem is not with the REST community as a whole, but with the people that behave in the way I’ve pointed out, here. The most consistent advice I’m seeing so far, is to start with the books I’ve listed / purchases already. That will at least get me heading down a better direction.